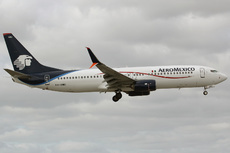 Aeroméxico flight AM668 was instructed to perform a go-around at San Francisco International Airport, California, USA after carrying out an approach to the wrong runway. The aircraft, a Boeing 737-800, was cleared to land on runway 28R, which was read back correctly. The aircraft then lined up on the approach for runway 28L. At that time a Virgin America Airbus A320-214 (N283VA), flight VX1041, had lined up on runway 28L in preparation for takeoff. The Tower controller observed AM668 approaching runway 28L and instructed the flight to go around. The aircraft circled for another approach and landed safely on runway 28L at 12:02 LT.